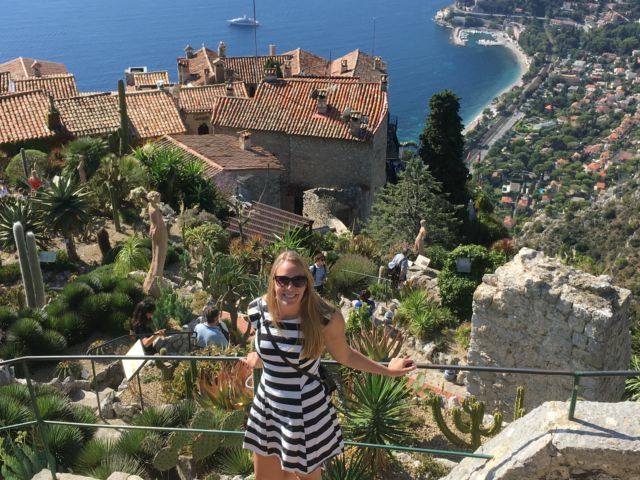 I was exploring Southern France and made a list of the Top 10 places in the French Riviera. My Top 10 list will help you discover the best places near Nice and Monaco, and most of them you can visit by train. The French Riviera has already for centuries been the Number 1 destination for millionaires, movie stars and royals and many of them have built their luxury vacation homes here. You can follow the footsteps of the rich to the most luxurious areas in the world. Or maybe you like more the old hilltop villages that exist all over the French Riviera? Take good shoes and start exploring the riviera. This is Eze, a hilltop village half way between Nice and Monaco. But let’s start with Nice. 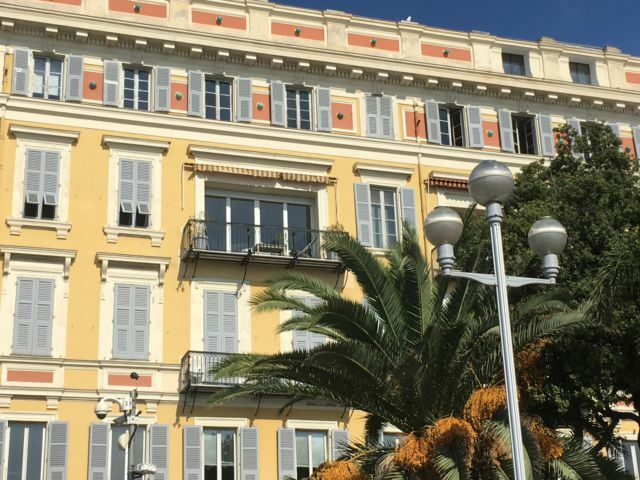 Nice is the the first of my top ten places in the French Riviera, it is the region’s biggest city and capital and its main tourist destination in its own right. The French Riviera’s capital combines luxury and shopping with an atmospheric old town with cafes, shops and market stalls. In addition Nice has a long pebbly beach with turquoise waters right in the city, running all the way to the airport that you can get to with a normal city bus. Easy and convenient! From Nice you will have very good bus and train connections to most destinations in the French Riviera. So even if you like Nice don’t spend all your vacation there, go ahead and see what else the French Riviera has to offer. Go and visit at my selected Top 10 places in the French Riviera. The places-to-see I will show you are not really in a set order – but I have to begin with the places you can’t miss and the first of them is my own favorite village, Villefrance just a short distance from Nice. The village of Villefrance-sur-Mer is right around the corner from Nice, only about 6 km round the peninsula. To get to Villefrance from other resorts you just take bus number 100 or the train. Villefrance train station is on the mountain slope right above the beach. And with the same bus 100 or train you can get on to another town that has a lot of colors, Menton. Menton is the last resort in the French Riviera before Italy, only a few kilometers from the Italian border. The city of Menton – like the area around it – is known for its warm micro-climate and the warm colors they use to paint their houses. Menton definitely is among the top 10 sights in the French Riviera. The old town with its yellow and rose-colored houses along cobbled streets is so pretty you can’t take your eyes from it. Walk around at daytime and after dark, Menton in evening light is also worth a visit. Menton has a lively shopping street where you can buy lemon products of the area, and there are two beaches, one sandy beach right in the old town and a long pebble beach on the other side. The Principality of Monaco is built on a narrow strip of land between the Mediterranean and the mountains. Monaco is lively, noisy and crowded. More and more people are moving to Monaco and the skyscrapers are getting higher. And the yachts in the harbour are getting bigger and bigger, at least during the annual Monaco Yacht Show that is held each September. But don’t take your rental car to Monaco, your French insurance doesn’t cover Monaco that is an independent country, even if you don’t see the difference so much. Take the upper road just behind the border and try to park your car somewhere and walk down to the city, or maybe better still, take a bus (bus 100 from Nice to Monte Carlo) or train all the way from Nice. Monaco definitely is worth a day trip from Nice. Cap-Ferrat next to Villefrance is one of the wealthiest areas in the whole world. Lots of celebrities, politicians and royal families have chosen to stay on this peninsula. The views are great, the villas magnific, the yacht harbor is good and the beaches lovely. Properties are not the cheapest on the Cap Ferrat peninsula and neither are restaurant dining menus. 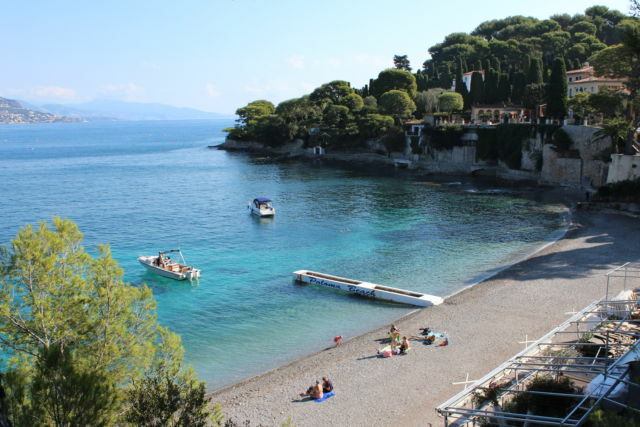 This is the beautiful Paloma beach, one of the many pretty Cap-Ferrat beaches. It’s a pebble beach and one of my favorites on the whole Riviera. Eze is a fortified hilltop village where most tour buses stop on their route around the French Riviera so it can be crowded during high-season. Anyway, the hilltop Eze is one of my top 10 sights in the French Riviera. 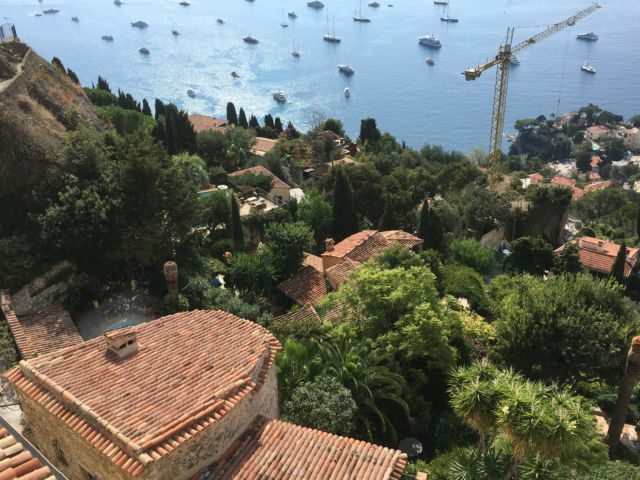 The old village of Eze contains narrow cobbled lanes, all of them hidden within the thick city walls. There are lots of small shops and excellent restaurants – and great views! For the best panorama climb to the botanical garden on the top of the hill! In Eze you park your car in the car-park below the old village. If you come by train you can choose to walk up along a steep path from the station down on the seashore. Or you can just take a connecting bus up to the village. The medieval village of Roquebrune has been built around a hilltop castle and belongs to the larger community of Roquebrune-San-Martin. From Roquebrune you get striking views to the Mediterranean and the peninsula of San-Martin that you can walk around along a marked footpath. The next destination on my top 10 places in the French Riviera list is in the west: Cannes. Cannes is a little bit like Nice, but in a small scale. Luxurious hotels, a green landscaped beach promenade and a long sandy beach. And as you know, this is the place where movie stars all gather and with a good reason. Drive up to the hill where the castle is, for great views of the city skyline. Saint-Paul-de-Vence is another village that’s located on a hilltop. It differs from the villages we have seen in that it’s not on the coast. It’s an inland village that you can easily reach by bus from Nice or Gagnes-sur-Mer. Saint-Paul is an artist village filled with art galleries and exhibitions in the hidden lanes. Like Eze Saint-Paul is a place where busloads of tour groups visit so it may be crowded (or surely is…). But tour organizers are not wrong, this is a very atmospheric village and very much worth visiting. To discover two non-touristic mountain villages, Peille and Peillon, you will need a car , reserve half a day. You need to drive a bit into the mountains. Take the road to Peille from La Turbie and return via Peillon to La Trinité and Nice. Both villages are medieval, Peille is on the mountain slope and Peillon stands on a hilltop. Mountain roads are narrow and have sharp turns but you can do it! There’s not so much traffic on those roads. These top 10 places in the French Riviera were my best picks of this beautiful area. When time allows I’m going to write more about the French Riviera and these destinations, in the meanwhile I want to wish you a nice trip! This a French Riviera map. You can find my Riviera Top 10 places on the map, they are in the area near Nice, Monaco and Cannes. Zoom in the map to see the places on the map.